I’m going to begin a new series of long overdue posts which will contain as historically accurate information about the Upper Perkiomen Valley and the three towns that were the stomping grounds of my youth: East Greenville, Pennsburg, and Red Hill. These will be categorized in a new group of posts called the Upper Perkiomen Valley. Anyone who is interested can click to the right on that category and sort all the articles. I’ll intermingle these with my usual bikes and builds and reviews but there’s so much history that I know and my father relays to me (and his father to him) about my hometown in Pa, I can’t NOT sit on it and not share it with all of you that read my blog. So to kick things off, I’d like to share some info about the image above. Hope everyone enjoys this content as there will be quite a bit more of these posts planned in the future. You can view all of the images via my Flickr album found here and download high-resolution copies of each photo including the one pictured above. So let’s begin! First Row: Donald Miller, Francis Wampole, Donald Eschbach, Clifford Raysor, Raymond Davis. Historical Note: Ernest “Ernie” Bauman’s (pictured 5th row, first from the left) first season was in 1947. He missed the first season. Halfway through the ’47 season, he found out his teammates were paid $2.50 for each game while he wasn’t being paid. This was corrected. However, I’m not sure if he was given back pay. Must not have been Union represented (I’m kidding of course). 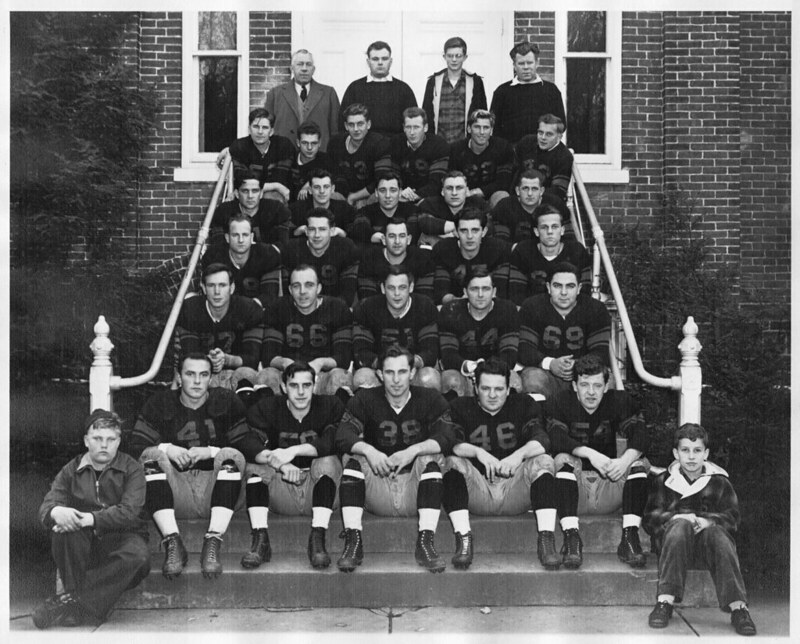 Editor’s Note: This photograph has been mistaken for the 1940 Pennsburg High School Football team. Unfortunately, this is incorrect. A fun side note about this mix-up is East Greenville and Pennsburg were traditionally bitter rivals. (My Grandfather Thomas P. Henry Jr.’s effigy was hung from a telephone pole a night before one of the big games, further illustrating how bitter this rivalry had become.) To drive this point home, Ernest Bauman, James Bardman and Herman Weiss all attended East Greenville H.S. and played for the E.G. Yellow Jackets. There is no way any of these guys would have been caught dead in a picture for the Pennsburg Football squad!